Syzygium jambos or ‘rose apple’ is also commonly known as the ‘Malabar Plum’. Although the fruit is used the tree does have its problems. Syzygium jambos is a native to India and The South Pacific Islands. This species is grown as a shrub to medium sized tree depending on conditions. Glossy leaves and fruit said to taste like ‘rose water’. In tropical conditions, which it requires to grow well to fruit well, Syzygium jambos will fruit for long periods, when not in fruit it is usually in flower. This is a plant that will grow in cooler climates in a protected warm position, however fruiting will be problematical. Grown from seed this is a tree that will take 5 – 6 years to fruit well on regular basis. Trees can be found in a few gardens in Queensland and Northern New South Wales, however it has not found its way into commercial propagation. Recently Syzygium jambos was found to be a tree with the potential to become invasive in parts of Australia, it is also said to be a host for Guava Rust (Myrtle Rust). It has proved to be invasive in other countries. 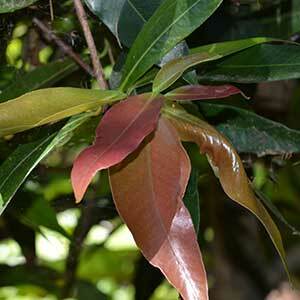 Syzygium jambos is not readily available in Australian Nurseries. We would suggest contacting local councils and agricultural departments before considering planting this tree.